You may be rooting for the lockout to end by tomorrow because July 20 is the official date when players would have started reporting for training camp, but there’s another good reason to hope that the NFL and NFLPA finally come to an agreement on Wednesday. 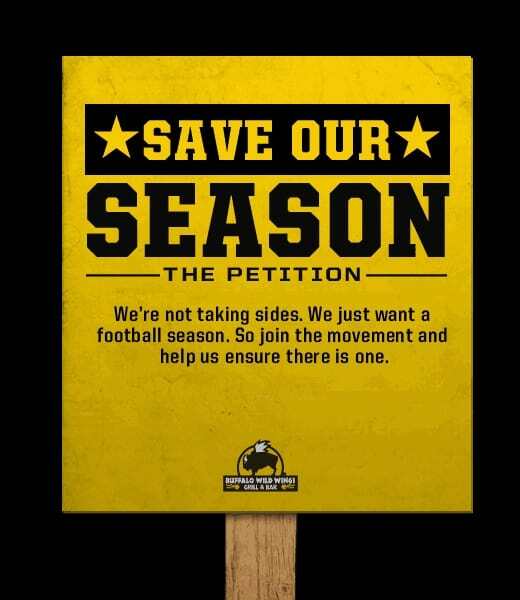 Buffalo Wild Wings has promised that if the NFL lockout ends on or before July 20, they’ll celebrate by giving away six free wings to everyone in America who signs BWW’s “Save our Season” petition on Facebook. Since the Facebook tab was not loading properly for me, you might have better luck finding the petition here on the Buffalo Wild Wings site. Yes, this isn’t going to help you in your fantasy football drafts (or will it? ), but this provider of fine winged products has been pretty good to the fantasy football community lately. The least we can do is enjoy some free wings if, in fact, their efforts pay off. Apparently, Buffalo Wild Wings has sent letters to both the NFL and NFLPA, as a representative of sports fans around the country, to plea that a deal be struck so everyone can enjoy some free wings. And they’ve even been so bold as to invite Commissioner Roger Goodell and DeMaurice Smith to wrap up negotiations over beer and wings. So if the deal gets done before July 20, I guess we’ll see the real power that BWW has over the NFL…or at least enjoy some wings. Foolish Thoughts on 2009 Season: So why didn’t we all draft Chris Johnson? It’s insanity. That’s what fantasy football is when it comes to the playoffs. Jonathan Stewart and Jerome Harrison become huge fantasy steals in the final two games, and studs that you’ve depending on all season like Drew Brees and Aaron Rodgers clam up and shut down early, even in blowout wins. At least Chris Johnson has continued to be magical every week. I forget how bizarre it really becomes until it’s this time of year again. Now Harrison will likely compel some fantasy footballers to draft him as an RB3 or maybe even an RB2 next season. Jamaal Charles could be right up there with him. We can only hope that neither is next year’s Steve Slaton or Pierre Thomas, hot in the playoffs but average or inconsistent the following season when given the full responsibility and trust of fantasy owners. In Charles’ case, I think he’s got a real chance to thrive in the Kansas City offense as long as the current coaching staff stays intact. He’s a great receiving back, and even if the Chiefs decide that they need to bring in a bigger runner to take some of the carries and compliment Charles in the offseason — LenDale White is available, or so I hear — Charles should get plenty of chances to put up big numbers as part of the explosive offense Todd Haley is trying to create. Out of the five fantasy football leagues I played in this season, I made the playoffs in three and had the chance to play for three championships this week. Of those, I won two and lost one by just a single point (as long as current calculations hold up) after Peterson racked up those two short-yardage touchdowns last night. It was incredibly frustrating, but I can’t be completely unhappy with the results. Even losing that one championship game out of three, this year has been my best season so far. And next season, I want to focus even more on the leagues that were truly competitive. I’ve reduced the number of leagues I played in over the past two seasons. This year, I was down to five, and next season, I’ll probably take it down another league or two until I find the sweet spot for managing leagues, writing fantasy football analysis, and enjoying the game. Here are some questions you can answer in the comments below: How many leagues do you play in? Do you find it more fun to play in a small number of leagues or as many as possible? These are the decisions I always debate this time of year. I think I’m one of the few fantasy football fans out there, especially among fantasy football bloggers, who cares more about their real team winning (in my case, the Cowboys) than their fantasy team. It excited me to no end when the Cowboys shutout the Redskins last night and secured a playoff spot. I wasn’t nearly as pumped when my fantasy football teams made the playoffs. Satisfied? Yes, but excited? Not off-the-wall excited. That said, it wasn’t a close call for any of them either. I knew weeks in advance that I was bound for the playoffs. I’d hope we’re all fans of the game and the action-packed saga that is the NFL. If not for it, we wouldn’t have fantasy football. So even if you lost your league, even if you got shot down in the championship game, even if your league dues were wasted as soon as you drafted Brian Westbrook and Matt Forte, I hope you’ll sit down and watch a few more games next week and deep into the playoffs. Playoff football is a treat that only comes around once each year, much like the holiday season that just passed. Our presents? The Super Bowl, one of the most extravagant and exciting sporting events in all the land. If you truly want to win in fantasy football, I think you first have to love the game because you have to understand how to translate what you watch and get excited about on the field into what works on your fantasy roster. So sit down, crack open a cold one (or a nice, frosty beverage of a less alcoholic persuasion if that’s your thing), and enjoy some football over the next month. Of course, it’d be nice to know you’re all doing it with a championship trophy on your mantel, like me, but if you didn’t win, there’s no shame in cheering your fantasy studs on to a Super Bowl as you start to prep for next season. And don’t feel like the fantasy season has to end. I’ll still be posting to Fantasy Football Fools because we have to start looking ahead to 2010 and because I still have some prizes to give to you, my dear readers. If you need help with Week 17 decisions (for those terrible, terrible leagues that go into the dreaded final week of the regular season), drop me a line on Twitter or in the comments. Thanks again for reading Fantasy Football Fools this season and being part of the foolish community. Stay tuned for more over the coming days. Even if you didn’t win your championship, you deserve to take home some prizes.